The Nex Flow™ Ring Vac ™ Compressed Air Operated Conveyor is now available in1” outside diameter (3/4” inside diameter) and up to 3”outside diameter (2-3/4” inside diameter) sizes in stainless steel as well as in aluminum adding to its previous range from 1” to 2” outside diameter sizes. Nex Flow™ Ring Vac ™ systems are Pneumatic Conveying units with virtually no moving parts that can convey solid material at high rates and over long distances. It utilizes compressed air for a powerful, efficient venture action along its length in a compact design for high capacity conveying over large distances. 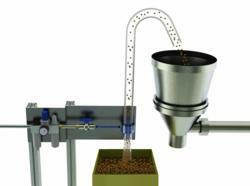 Simply clamp a standard hose size to each end of the Nex Flow™ Ring Vac ™ to create the high energy conveying system. No moving parts means maintenance free operation with the flow rate and capacity controlled using a pressure regulator. The standard Nex Flow™ Ring Vac ™ system is available in anodized aluminum from ¾” to 3” outside diameters in standard as well as threaded versions and from 1” to 3” outside diameters in standard stainless steel and threaded stainless steel units. Convey small items including food items from cheese bits to dried peas. See http://www.nexflowair.com or http://www.nex-flow.com for full product details and prices. Sizing help is just an e-mail away at sales(at)nex-flow(dot)com or by calling Toll Free 1-877-797-2777 in the USA and Canada. International calls use +1-416-410-1313.